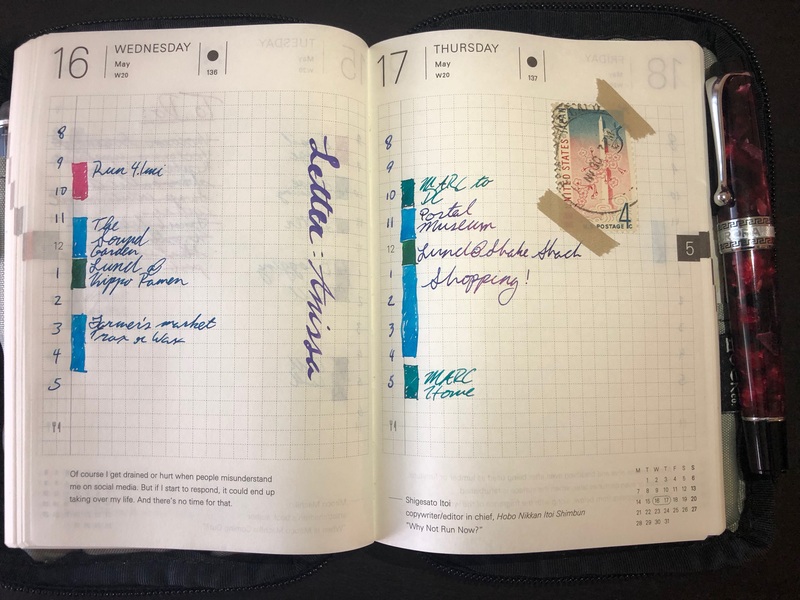 A few different people have asked me how I’m using my Hobonichi Planner lately, so I thought it might finally be time for a blog post about it. I got my Hobonichi as a Christmas present this year, and started using it on the first of year. Since then, I’ve used my Hobonichi almost every day in, what I think is a fairly unique way. A big part of the “Hobonichi Community” that you find on Instagram focuses on using a Hobonichi for artistic purposes, but I’ve never been much of an artist. So when I got the Hobonichi, I did struggle to figure out how it was going to fit into my notebook usage. I already had places that I did some longer form journaling every evening, I wrote about that here. So the Hobonichi wasn’t going to be used as a journal. What, then? As I look back, I can see that on January 8th I hit my use case: using the planner as a daily planner. On the left hand side of every page, there’s a little ‘12’ printed about halfway down the grid side of the page. I simply numbered out each of the workday’s hours as two grid squares, and filled in as the day went on. It’s not full on time tracking because I don’t account for all of my activities in there, just the ones that I feel are meaningful. So if I’m on a call for a while, or out running, or running errands, I’ll mark that time and fill in the squares. My Hobonichi tends to live on my desk, which makes it a nice way to have a little “at a glance” look back over my day. Color wise, I just choose whatever I feel like using for that period for each block. I’ll stay consistent as long as that pen is inked up, and then I’ll move on to something else once a pen is cleaned out. Although, I to tend to lean towards more browns and reds for my runs...I wonder what that signifies. I’ve also moved most of my to do list into my Hobonichi as well. While I still use 2Do for most of my repeating tasks, I find that going through the effort of physically writing down something that I need to do just helps make it feel a little more real. Plus, striking a task through with a big, broad pen when I get something done just feels intensely satisfying. Because I only use my Hobonichi for day to day stuff, I basically ignore all of the calendar things in the book. I already have a great shared calendar system with my wife, so I don’t find any real value in duplicating that in the monthly view. Most of the time, I forget it’s even in the front of the book. I also don’t worry if I miss a day. Sometimes I’ll throw a quick quote in a page, or do some ink testing with empty days. After all, it’s still a bunch of pages of Tomoe River paper, and using any pen is a joy on that. I’ll also make notes when I write a letter to someone so that I have a record of that, but I’m not particularly consistent with that habit. And finally, accessory wise, my Hobonichi (which is actually the Hobonichi x Steiff edition) lives in a Nock Co. Seed A6 case in the Steel/Silver Dust colorway. If I’m headed out and about, I’ll usually put my Platinum 3776 Nice Pur in the pen pocket because the fine nib fits really well in the little grid that the Hobonichi uses. The Hobonichi does tend to push me towards finer nibs. And that’s about it. While I love seeing the other uses that people have for their Hobonichi, this one is mine. 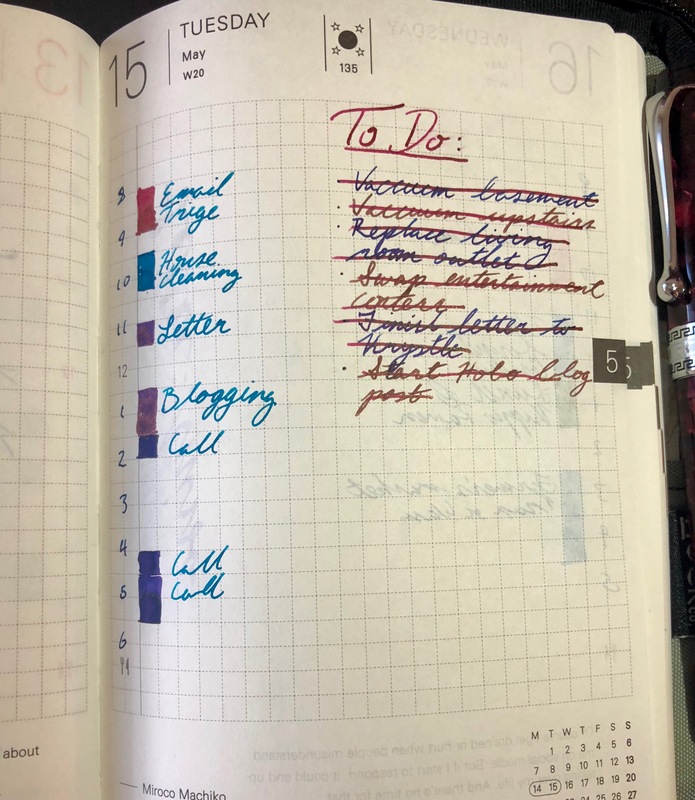 I’m sure there’s more that I could do with it, but it gives me a place to play with pens every day, and flipping back through makes me happy with how I use it. And really, isn’t that how we all want to feel when we look back through a notebook?